An international team of astrophysicists led by Volker Springel (Max Institute for Astrophysics) has used some of Europe's largest supercomputers to show where NASA's newest satellite observatory should look to see the mysterious dark matter which fills the Universe (Nature, November 6th 2008). Fig. 1: Projected dark matter density in the simulated Milky Way sized dark matter halo. A myriad of dark matter subclumps is embedded within the virialized region of the galaxy's halo. Their dense centres emit energetic gamma-rays from the annihilation of dark matter particles. Fig. 2: An all-sky map of the faint gamma-ray glow produced by dark matter annihilation in the Milky Way's dark matter halo. Due to the proximity to the Sun, the Galactic centre is the brightest and most extended source. This makes it easier to detect than any of the small dark matter subclumps that are distributed over the sky. If one of them should also be detected, it may be devoid of any stars. The Fermi telescope has already been mapping the sky for several months using gamma-rays, a form of radiation which is even more energetic than X-rays. 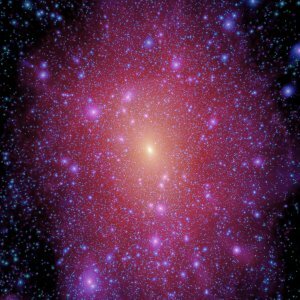 Within a couple of years it may detect a glow from the dark matter whose gravitational effects astronomers first detected more than three quarters of a century ago, but which has so far remained stubbornly invisible to all our telescopes even though it apparently accounts for 85% of all cosmic matter. Most cosmologists believe that this dark matter is a new kind of elementary particle yet to be detected on Earth (though the Large Hadron Collider might provide evidence for it once its magnets are fixed). Under the right conditions these particles may produce enough gamma-rays for Fermi to detect them. But where should Fermi look to see this gamma-ray signature of dark matter? A team of astrophysicists from Germany, the UK, Canada and the Netherlands (the "Virgo consortium") have used one of the largest of all European supercomputers to simulate the formation of the dark matter structure that surrounds a galaxy like our own Milky Way. Such "dark matter halos" are more than a trillion times as massive as our Sun and are the basic units of cosmic structure. Simulations by the Virgo team show how the Milky Way's halo grew through a series of violent collisions and mergers from millions of much smaller clumps that emerged from the Big Bang. Most of these were disrupted during the formation process, but some survive, the largest harboring familiar satellites of the Milky Way such as the Large and Small Magellanic Clouds or the Sagittarius dwarf galaxy. Other clumps were too small to make any stars, but are still predicted to lurk in our Galaxy's halo, so far undetected by any telescope. Gamma rays are produced in regions of high dark matter density when the particles collide and annihilate in a puff of radiation. 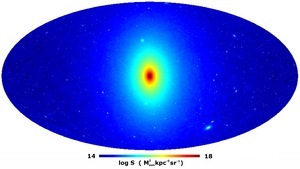 Many cosmologists have argued that Fermi should search for gamm-rays from the Milky Way's satellites, since their centres should be very dense. The Virgo team's simulations demonstrate that this is not the best place to look. Their careful calculations show that by far the most easily detectable signal should come from regions of the Milky Way well inside the Sun's position, but well away from the centre itself. Looking right at the centre would be a poor strategy for Fermi because of the danger of confusing the signal with gamma rays coming from other sources, such as the remnants of supernovae or the gas clouds where stars form. Instead, the Virgo team recommend looking 10-30 degrees off-centre, where they predict that the dark matter should glow in gamma-rays in a smoothly varying and characteristic pattern. If Fermi does detect the predicted emission from the Milky Way's smooth inner halo, then it may, if we are lucky, also see gamma-rays from small (and otherwise invisible) clumps of dark matter which happen to lie particularly close to the Sun. These clumps will be substantially fainter than the main halo, but may still be detectable. The known satellites may be visible in gamma-rays too, although their greater distance makes them even harder to detect. The search for dark matter has dominated cosmology for many decades. It may soon come to an end. The largest simulation took 3.5 million processor hours to complete. Volker Springel was responsible for shepherding the calculation through the machine and said: "At times I thought it would never finish." Max Planck Director, Professor Simon White, remarked that "These calculations finally allow us to see what the dark matter distribution should look like near the Sun where we might stand a chance of detecting it. Professor Carlos Frenk, Director of the Institute for Computational Cosmology, said: "Solving the dark matter riddle would be one of the greatest scientific achievements of our time. It is striking that even theoretical advances on such major scientific problems are now made by international collaborations such as ours."